The angle at the centre is twice the angle at the circumference subtended by the same arc. The sum of the measures of the interior angles in any convex quadrilateral is 360 degrees. Try to find a quadrilateral with angles expressed using a,b,c or a scaled version of them. It's a 2 or 3 line solution. 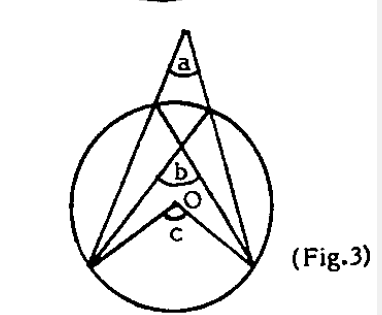 Find the angles subtended at the circumference of the circle and then, using that information, focus on the diamond shaped quadrilateral formed at the top of the diagram to obtain a relation between the three angles.